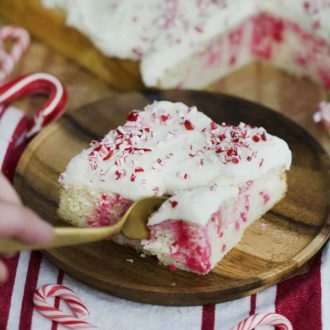 Even if you don’t like candy canes (me (shockingly)) I swear you will love this cake! The crushed candy mixed into the batter melts during baking and created these pockets of liquid that basically burst in your mouth! The cake itself is super moist, flavored with vanilla and basically foolproof. I haven’t even mentioned the colors yet; 100% HOLIDAY! This has to be the easiest cake ever! It’s basically a super-moist vanilla cake with crushed candy cane mixed in topped with the perfect buttercream and a hint of mint. This was definitely one of the most popular cakes I’ve made for the holidays soooo maybe make two? If the texture of candy canes is what bothers you then go ahead and don’t use them in the buttercream. They melt in the cake during baking so there’s no sticky or crunchy bits to work about there. If you American buttercream is too sweet for you try whipping up a batch of Swiss or Italian meringue buttercream! 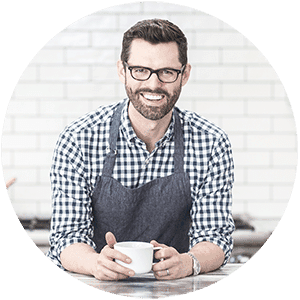 To get a perfect unblemished edge just use a sharp serrated knife to trim a 1/4 inch from each side. 1. Preheat to 350 degrees F. Add parchment paper to a cake sheet. In a stand mixer fitted with a paddle attachment, cream the butter, then mix in sugar. Add in vanilla and salt. Mix until creamy. 2. In a medium bowl, sift flour and baking powder together. 3. 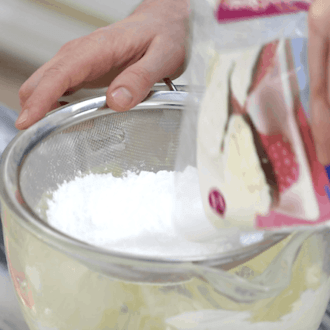 Add egg whites to stand mixer, then mix on medium until combined. 4. Whisk milk and sour cream together in a separate bowl. 5. Alternate adding milk mixture and dry mixture. Mix until batter is fully combined. Fold in 1/3 of the crushed candy cane. Do not over-mix. 6. 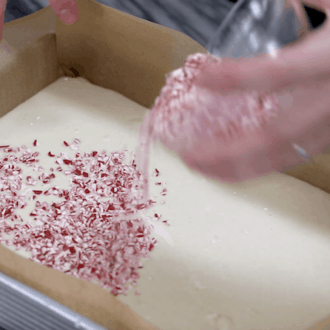 Pour cake batter into sheet cake pan. 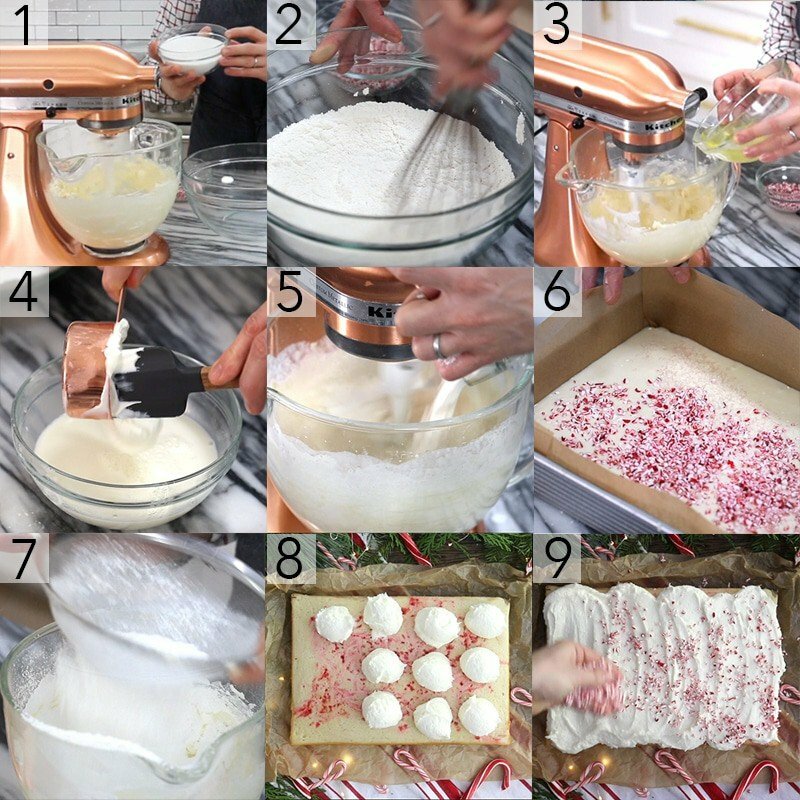 Sprinkle ⅓ crushed candy cane into batter. Swirl with a spatula. Bake for about 30 minutes or until cake is springy in the middle. Let cool. 7. For the Frosting, cream the butter in a stand mixer fitted with a paddle attachment. Add the sifted sugar while mixing on low. Slowly pour in milk, peppermint extract and vanilla. Beat until combined and fluffy. 8. For the Assembly: Use an ice cream scoop to evenly distribute the frosting on the cake. Smooth with an offset spatula. 9. Sprinkle the last ⅓ of crushed candy cane. and ENJOY!!! If you’ve tried this sheet cake then don’t forget to rate the recipe and let me know how you got on in the comments below, I love hearing from you! 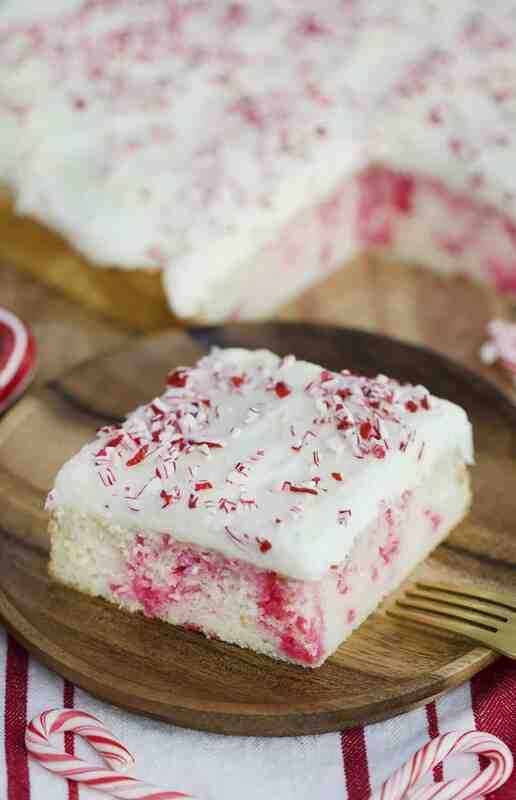 Fluffy peppermint sheet cake with crunchy candy cane topping! Preheat to 350 degrees F. Add parchment paper to a cake sheet. Add in vanilla and salt. Mix until creamy. Whisk milk and sour cream together in a separate bowl. In another bowl, sift flour and baking powder together. 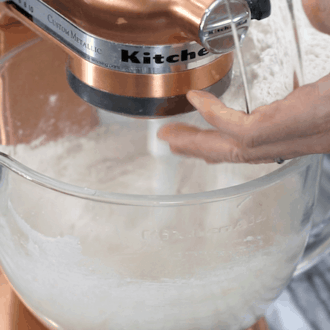 Add egg whites to stand mixer, then mix on medium until combined. Alternate adding milk mixture and dry mixture. 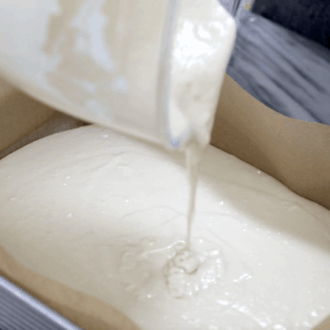 Mix until batter is fully combined. Fold in 1/3 of the crushed candy cane. Do not overmix. Pour cake batter into sheet cake pan. Sprinkle ⅓ crushed candy cane into batter. Swirl with a spatula. Bake for about 30 minutes or until cake is springy in the middle. Using a stand mixer fitted with a paddle attachment, cream the butter. Add the sifted sugar on low. Slowly pour in milk, peppermint extract and vanilla. Use an ice cream scoop to evenly distribute the frosting on the cake. Sprinkle the last ⅓ of crushed candy cane. Use baking powder in this recipe! I LOVED this cake! Although the cake is not made with cake flour, the cake was very light in texture. I thought there was just the right amount of peppermint flavor. I was worried it might be over-powering, but it was just right, IMO. I loved the fluffy buttercream. And it was a very pretty cake, too. I also love this cake, because it uses up a lot of my egg whites that I keep in the freezer. (A lot of recipes I make call for egg yolks, so I just put egg whites in Ziploc baggies, and put them in the freezer, and thaw them when I need just the whites.) My only complaint with this recipe is that I felt it needed more specific instructions. For example, in neither the recipe nor the video, there was no indication of what size of pan to use. After watching the video, I just guessed that it was a 9×13 pan that was used, so that’s what I did, and it turned out just fine. Also, after watching the video several times, I heard you say to add a “heaping 1/2 cup of sour cream.” In the recipe, it just says 1/2 cup. That’s why I’m giving it 4 stars instead of 5. Other than hoping for more specifics in the recipe, it was a great recipe. Thanks for sharing it! Could this be divided to make individual cakes as a hostess gift? Yes, you probably could! That is a cute idea. How small of a pan would you use?